Lab501 shot a picture of the ASUS TUF Sabertooth Z77 at CeBIT, a new entry in ASUS' line of ultra-stable motherboards. The new design blankets most of the motherboard with a black, perforated sheet that directs airflow. We spy four DDR3-DIMM slots (with matching Corsair Vengeance modules, not included), and an all-PCIe expansion slot layout, with two PCI-Express 3.0 x16 slots, one PCIe 2.0 x16 (x4), and three PCIe x1. There are two additional SATA 6 Gb/s ports augmented to the ones provided by the Z77 PCH. Display connectivity looks to include DVI and HDMI. 8-channel HD audio, GbE, about 6 USB 3.0 ports, and a number of USB 2.0 ports, complete the package. 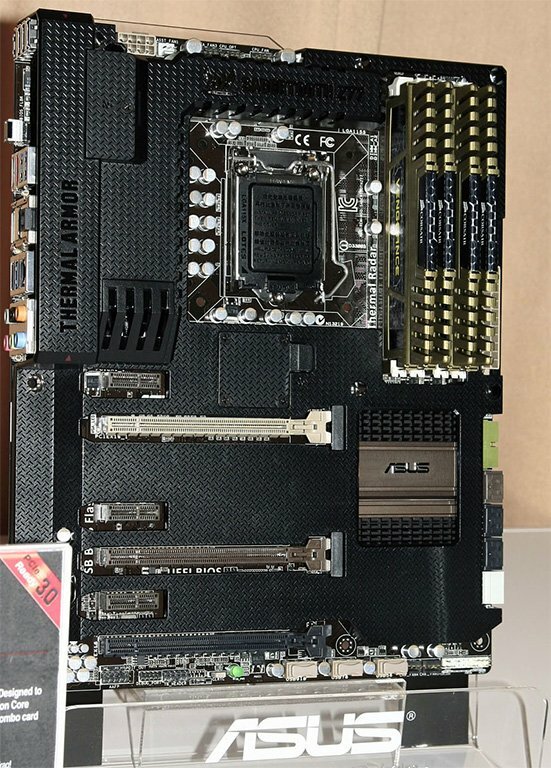 The board supports ASUS' BIOS Flashback feature. ASUS TUF Sabertooth motherboards are designed to be rock-stable and durable enough to be certified by stress-testing agencies for it.